Dillman UB church is presenting its cantata “Liberty” on Sunday, July 8, at 6 p.m. The performance will be held at College Park UB church in Huntington, Ind. Dillman originally did this cantata on the opening night of Central Conference several years ago. They later added some characters and performed it at the Life Center in Bluffton, Ind., for a few years. Now, after taking a few years off, they have revived it. They needed a larger venue than Dillman’s church, and College Park offered their facility. Years ago I was teaching an all men’s Sunday school class and wanted to have them turn to some Scriptures that were not in the quarterly they used. Only one man had a Bible with him. I encouraged them to set the example by bringing their Bibles, noting that a Christian without his Bible is like a soldier on the field without his gun and food. I also realized that if they didn’t carry their Bibles with them to church, they probably weren’t picking them up at home, either. After the class, one of the regular teachers challenged me. He said he didn’t always see me pick up a hymnal in church and compared the two. I told him that I had those hymns memorized, and if the men memorized the Scriptures and could recite them at any time, I was fine with that. He walked away. I am finishing John MacArthur’s newest book The Truth War. Throughout history, God’s people faced popularized ideas and doctrines that were not biblically sound. We are to be, as MacArthur says, “warriors for the truth,” not looking to pick theological fights, but also not afraid to confront error. I commend the book to you. I ask my fellow teachers to take their role seriously in preparing God’s people for the battle for truth. I am reminded of Paul’s admonition to Timothy, “Preach the Word.” Line by line, verse by verse, book by book, concept by concept. The Body is ill and ill-prepared because we are not teaching well. Popularized programming and care ministries do little to strengthen the Church. We need to know the truth, and the truth will set us free. So place your major emphasis on studying to show yourselves approved, a workman that need not be ashamed, rightly dividing the Word of truth. And teach your people to do the same. The clouds of greater war days, the end days, the last days, are forming. And we will be held accountable for how we have prepared God’s people for it. Mrs. Margaretta Manchey passed away on June 2 at age 95. She was recognized by the Guinness book of World Records for having played the organ at her home church for 77 years. Her home church is Otterbein Church in Waynesboro, Pa. (a United Brethren congregation until withdrawing in 2005). She also played the organ for campmeetings in the old tabernacle at Rhodes Grove Camp for decades. The funeral was held June 8 at Five Forks Brethren in Christ Church in Waynesboro. The 2007 US National Conference, meeting on June 1 in Huron, Ohio, gave official approval to five changes to the Constitution. All five proposed changes, called referenda, were advanced by the 2005 US National Conference and voted upon by members of all UB churches in the United States during February 2007. The delegates responded by giving their assent with comparable percentages (a two-thirds vote is needed to make a referendum official). 1. Referendum 1 removed some language from the preamble which the new structure adopted in 2005 makes obsolete (specifically, reference to annual conferences). The US National Conference approved two changes to the National Church Covenant, which United Brethren churches must sign every two years (2007 was the first year for that). The covenant consists of eight points. By action of the 2007 US National Conference, points 5 and 8 have been removed. Point 5 says, “They are intererested in partnering with other like-minded churches.” It was explained that this point is vague and nobody is sure exactly what it means (nor how to force churches to comply with this). Point 8 says, “They support the work of the camps, university, and other ministries of the Church of the United Brethren in Christ, USA.” This line was added from the floor of the 2005 National Conference. Pat Jones, Director of Healthy Church Ministries, explained that this is the only part of the covenant which is programmatic in nature, in that it requires supporting two “programs” of the church–the camps and university. He pointed out that most of the camps are now separate entities from the denomination, organized with their own board of directors; so that part was already obsolete. He stressed that there is no intention of weakening the relationship with Huntington University. This issue received a good deal of discussion at the spring 2007 Executive Leadership Team, and the ELT passed on the recommendation that item 8 be removed. The original desire with the covenant was to keep program issues out and stick mainly to matters of philosophy and relationship. If we include the camps and college, why not also specifically name Global Ministries and church multiplication, which are arguably more central to the work of local churches? Other potential additions might include Women’s Ministries, Bible quizzing, and the Youthworkers Summit. They are committed to the Confession of Faith. They agree with the core values of the United Brethren in Christ, International. They agree to abide by the Constitution and Discipline of the US National Conference. They are passionate about fulfilling the Great Commission through their local church. They are interested in partnering with other like-minded churches. They support the ministry and mission of the United Brethren Church, USA, through the annual partnership fee. They will participate in a cluster. They support the work of the camps, university, and other ministries of the Church of the United Brethren in Christ, USA. The past few days I have enjoyed reflecting on National Conference. It was such a joy to watch the interactions of all the attendees with each other. Sharing ideas, renewing friendships, discussing the speaker’s points, praying for each other, simply caring for each other. It was a beautiful snapshot of the Body of Christ. The most potent memory for me will be Sunday morning. After some time of joyous, focused worship, we took time to give opportunity for us to write out on a piece of paper any sins that are easily entangling our lives or the lives of our churches. And we nailed them to the cross in confession before celebrating communion. I had a powerful God moment in that. After introducing the process, I sat down on the edge of the stage, praying and reading Scripture. Periodically I would look up and watch. The lines on each side continued to grow and grow and grow. Some nailed their papers gently. Others angrily nail them to the cross, seemingly scorning the shame of it all. But hundreds upon hundreds of us brought things to the right place. I did. And freedom was found in Christ, once again. Following, I watched (and personally experienced) as people went to each other, settling debts or asking forgiveness. Joy was abundant, the joy of the Lord. And we all were strengthened for it. The days ahead will require this same Spirit. The sacrifices of God are a broken spirit; a broken and contrite heart, O God, you will not despise. (Ps. 51:17) And then the Bishop reminded us of all the wonderful blessings and privileges that are ours in Jesus. The mission, the power, the desires. All found in our positional relationship to Jesus Christ. Now we continue moving forward, renewed in the strength of Jesus Christ, the Head of the Church. So what was your take away? We’d like to hear from you. What were your God moments? What was most encouraging? What challenged you the most? What changed you and your fellow delegates? 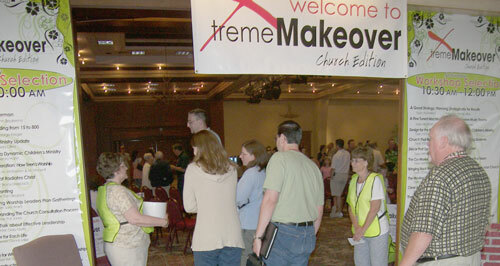 The 2007 US National Conference drew over 920 UB people to the Sawmill Creek Resort in Huron, Ohio. This may have been the largest UB gathering ever. The only comparable event was “Challenge 88,” the “Vacation with a Purpose” convention held in 1988 in Knoxville, Tenn.
Bishop Ron Ramsey assembled a planning committee of persons from Indiana, Ohio, Michigan, and Pennsylvania, and pretty much told them to pull out all the stops to make this conference–the first of its kind–a truly memorable event. And so they did pull out the stops–with the speakers, music, decorations, equipment, videos, signage, promotional materials, give-away items, and numerous small touches. The event was also designed to focus on the future, to portray a church that is progressive and forward-looking. Follow the link below to glimpse various tidbits from the conference, to help you catch a feel for it. Delegates to the US National Conference elected eight of the 12 members of the Executive Leadership Team. The ELT, the highest governing body between sessions of the National Conference, meets twice a year. The delegates chose one layperson and one ordained minister from each of the four regions. Four of the persons chosen are new. The representatives from the East and North regions remain the same, but both persons elected from the Central and West regions are new–and in both cases, both the minister and layperson come from the same church. That’s just the way it worked out. Todd Fetters (senior pastor of Devonshire Church, Harrisburg, Pa.). Annette Sites (pastor’s wife, Jerusalem Chapel, Churchville, Va.). Marty Pennington (senior pastor, Mainstreet Church, Walbridge, Ohio). Timothy Krugh (layperson, Mainstreet Church, Walbridge, Ohio). Phil Whipple (senior pastor, Colwood Church, Caro, Mich.). Dan Paternoster (layperson, Fowlerville UB, Fowlerville, Mich.). Stan McCammon (senior pastor, Good Shepherd Church, Huntington, Ind.). Cathy Reich (layperson, Good Shepherd Church, Huntington, Ind.). Bishop Ramsey and the Executive Leadership Team will appoint four more persons to the ELT, one from each region (2 laypersons, 2 ministers). Bishop Ramsey is chairman of the ELT, but no other employees from the national office or denominational positions are voting members. 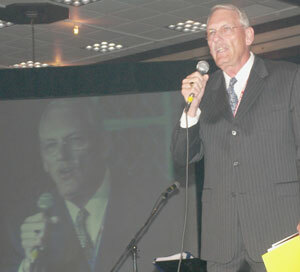 Ron Ramsey was re-elected as bishop of the US National Conference during the business session on Friday morning, June 1. He was the only nominee placed before the conference. When Bishop Ramsey was elected in 2005, the understanding was that he would serve a four-year term. However, the Constitution required that each National Conference elect a bishop, and since national conferences now meet every two years instead of every four years, it presented a temporary problem. That particular item in the Constitution was removed through one of the five referenda this year, but since changes won’t take effect until August, it was still necessary to elect a bishop. And so, a ballot with just one name was presented, and Bishop Ramsey was chosen unanimously. The delegates also approved a statement in the Discipline saying that the National Conference will elect a bishop to a four-year term. We will elect a bishop again in 2009, but after that, the next election will be in 2013. We’re currently registering students for our summer classes for both children and adults. Although our staff is limited this summer, I’ve tried to offer classes that will allow students from last summer to come back this summer. It’s been good to see many of the parents I know coming to register their children. Pray that God will bring just the right children this summer, and for His guidance in the best ways to help them spiritually. Each summer is the key for establishing a group of children to follow up with throughout the school year. This Sunday we’re having an English Language Program Sunday at Living Stone Church. We’ve invited all of our adult English students to attend the worship service. Most of them are not Christians. Pray that many of them will come and that they’ll be touched by the warm fellowship and the message that morning. Pray for Winnie and Fanny, two ELP students who’ve been coming to a Bible study I lead each week for non-believers. Neither of them know much of anything about God or the Bible. Pray that God will give them understanding and that their hearts will be open to Him.